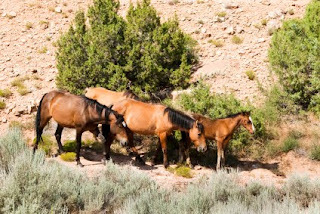 With today's deaths of two more older mares, the total number of horses who have perished in the aftermath of the Calico roundup is at least 62, more than 3% of the 1922 "excess" mustangs the BLM claims it drove from the Nevada Herd Management Area. As has been the case during the three weeks since the end of the "gather," the deaths of most of these horses have been categorized as due to "hyperlipemia or metabolic failure," and that was the situation again today, when two 20-year-old mares perished because they were never able to recover from the stress of the chase and subsequent captivity. A very disturbing mortality pattern has emerged, one which points to a much greater loss of life than has heretofore been reported. Since February 1st, 20 of the 28 horses who have lost their lives in the Indian Lakes Road feedlot pens near Fallon, Nevada have been mares of reproductive age. Until now, the BLM Gather Activity Updates have been suspiciously silent about the pregnancy status of any of these mares, but it seems reasonable to assume that most--if not all--of them were heavy in foal. So two lives were lost every time a mare died. In fact, this suspicion was confirmed. . .